Pope Francis Delivers First Papal Mass On Arabian Peninsula His three-day trip was intended to promote religious fraternity and diversity, at a time when long-established Christian communities in the Middle East are dwindling. 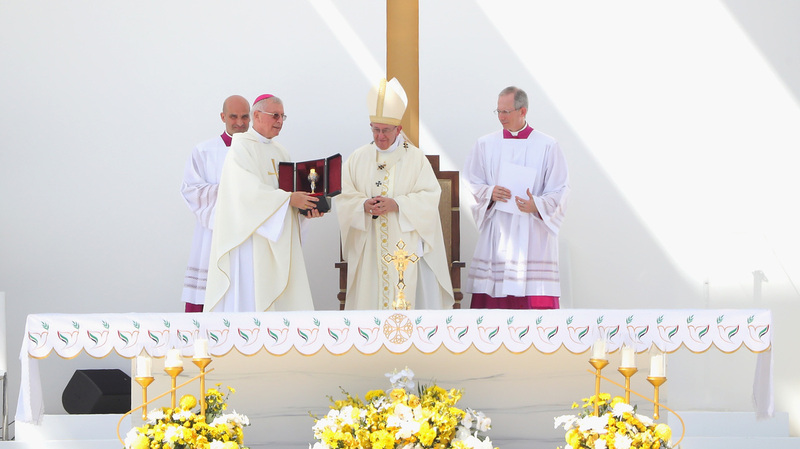 Pope Francis celebrates Mass on Tuesday at Zayed Sports City in Abu Dhabi. His three-day trip to the United Arab Emirates marks the first time a pontiff has ever visited the Arabian Peninsula. Pope Francis wrapped up the first-ever papal trip to the Arabian Peninsula — a visit meant to highlight religious fraternity — by celebrating Mass before tens of thousands of people at a sports stadium in the United Arab Emirates. An estimated 180,000 people filled the seats at Abu Dhabi's Zayed Sports City Stadium for Tuesday's open-air Mass. Many attendees wore white baseball caps, waving Vatican City flags and cheering as Francis entered in a white, convertible popemobile. It was described as the largest public display of Christian worship in the Gulf state. People hailed from 100 countries, according to the Vatican. They included asylum-seekers, migrants and 4,000 Muslims. "Someone who is afflicted, who suffers injustice, who does everything he can to be a peacemaker, knows what it means to suffer," Francis told the crowd in his homily. "It is most certainly not easy for you to live far from home, missing the affection of your loved ones, and perhaps also feeling uncertainty about the future. But the Lord is faithful and does not abandon his people," he said. Francis added, "Those who attack or overpower others are not blessed, but rather those that uphold Jesus' way of acting, he who saved us, and who was meek even towards his accusers." The mass came a day after Francis urged Muslim and Christian leaders to promote peace and religious tolerance in the region. On Monday, he met with Sheikh Ahmed el-Tayeb, the grand imam of Al-Azhar University in Cairo, a prominent center of learning for Sunni Islam. They signed a declaration promoting "human fraternity," and appealed to religious leaders for peace between nations, faiths and races. "We resolutely declare that religions must never incite war, hateful attitudes, hostility and extremism, nor must they incite violence or the shedding of blood," the document read. "These tragic realities are the consequence of a deviation from religious teachings." The pope also spoke out about conflicts in Yemen, Syria, Iraq and Libya. "No violence can be justified in the name of religion," he told imams, ministers, rabbis and other religious leaders. The interfaith meeting on Monday was sponsored by the Muslim Council of Elders, an organization that NPR's Sylvia Poggioli says works to counter religious fanaticism and promote a moderate form of Islam. As many as 1 million people living in the UAE identify as Catholic, according to the Church. Many of those adherents are foreigners who arrived in search of work in a country whose population is comprised mostly of foreigners. Emirati leader Sheikh Khalifa bin Zayed declared 2019 the "Year of Tolerance" to show the UAE as a "global capital for tolerance." Human rights groups say that declaration "rings hollow" amid what they call a crackdown on free speech, while others point to multiple human rights abuses. As Poggioli reports: "Sharia law prevails, and freedom of worship has a lot of restrictions. For instance, no church bells. There are no church bells. Crosses can't be seen in public, and conversion from Islam is a crime punishable by death." Francis' visit to the region represents what Poggioli calls "an important encounter ... in an area where those people, that community, is growing at the same time that long-established Christian communities in the Middle East are dwindling." Francis' underscored both the beauty of diversity and the power of unity during Tuesday's Mass. "You are a choir composed of numerous nations, languages and rites; a diversity that the Holy Spirit loves and wants to harmonize ever more, in order to make a symphony." In 2006, Pope Benedict XVI incited outrage in the Muslim world by quoting a 14th century Byzantine emperor's criticism of Islam: "Show me just what Muhammad brought that was new, and there you will find things only evil and inhuman, such as his command to spread by the sword the faith he preached," Benedict said. That prompted 138 Muslim scholars to write a letter to Benedict and other Christian leaders emphasizing that world peace depended on harmony between the two faiths.